I have a teacher confession to make: I’ve never made my own curriculum map before this year. (Gasp! I know!) I’ve always either worked at a school that provided one for us or on a team that didn’t think it was necessary. My experience making a curriculum map this year has convinced me that it is one of the best things I can do over the summer to prepare the following year. Today, I wanted to share why I think it’s so important, and I have a resource to help you get started. What exactly is a Curriculum Map? A curriculum map is exactly what it sounds like… a map… of your curriculum. Simple enough. But it can be really powerful, when it’s done right. A curriculum map lays out all of the concepts and skills you’ll be teaching for the year, in order, and with a guide as to how long you will teach each skill. 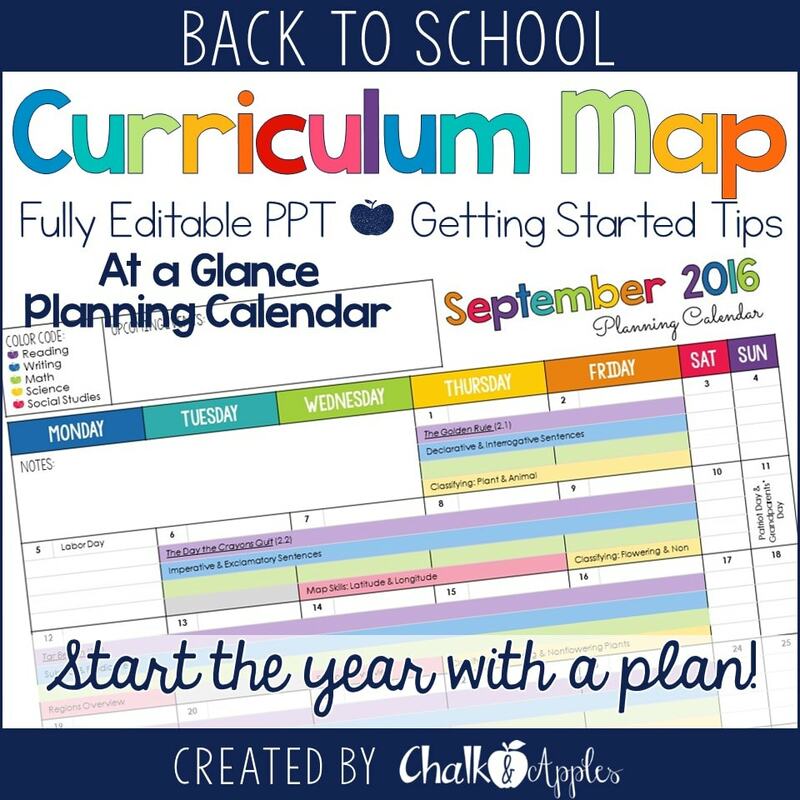 I personally like putting my curriculum map on a calendar, because it helps me with my lesson plans throughout the year. It seems like a lot of work. Why should I bother? 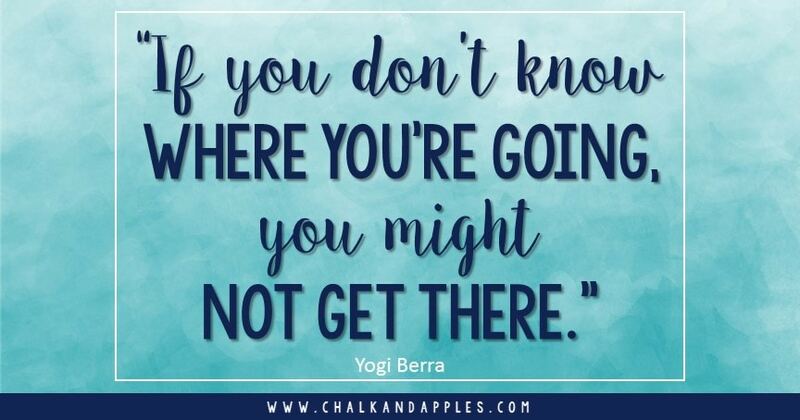 Yogi Berra once said, “If you don’t know where you’re going, you might not get there.” I have no idea what the original context was, but this is a particularly powerful quote for teachers. Each year, it seems that we have more and more content to cover throughout the course of the 9-10 months we have our students. Without a solid plan in place, we can easily get swept into spending too long on certain concepts and run out of time at the end of the year or before standardized testing. I hear from teacher friends in my school and around the country that are constantly feeling like they are running out of time to teach everything. A solid curriculum map can be the first step in solving this common problem. My experience with writing my own curriculum map this year has been a powerful one. Since I am moving grade levels, creating a curriculum map has helped me to dig through my new set of standards, really thinking through how to teach them, and in what order. I’ve also had the opportunity to align the mentor texts I love and our basal reader selections with the science and social studies curriculum, so that I am getting the most “bang for my buck” with each book or story. 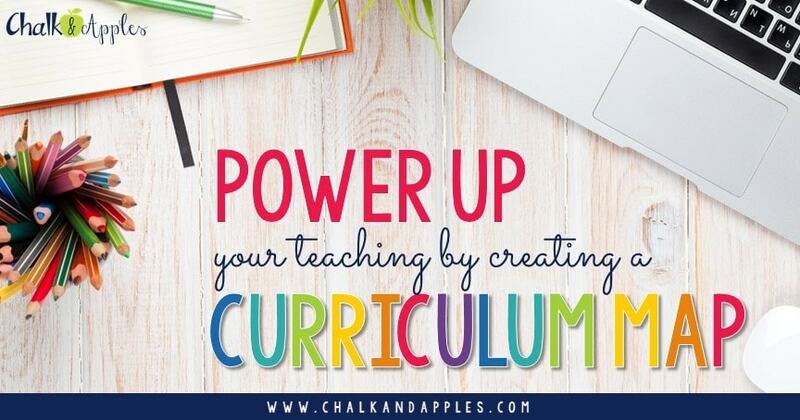 Writing your own curriculum map before the school year starts allows you to really plan out the skills and concepts you teach together, so that your units are more integrated. Can’t I just use the pacing guide from my district? Well, yeah, I guess you could. And that’s what I did for years. But here’s the thing… Most district pacing guides are just that, a guide. They’re pretty broad and generic. They typically include the general topics, but not much in the way of resources or specific activities. They definitely don’t take into account your own teaching style or the specific needs in your classroom. When you write your own, you can include all of these things, and you’re much more likely to actually refer to it throughout the year. What if I get off pace? It happens. And it’s ok. Give yourself a little grace. What would you do if you got off track when following a road map? You’d look at it again, and find a way to get back to where you’re supposed to be. When you get off of your curriculum map’s pacing, don’t stress over it. Just take a look again, and decide how to best get back on track. It sounds simple, but start with what you’re supposed to be teaching. I looked first at my reading, writing, science, and social studies skills, because we are implementing new math curriculum this year, and will be receiving a pacing guide for it at the beginning of the year. Once I receive that, I’ll come back and add math skills to my curriculum map. 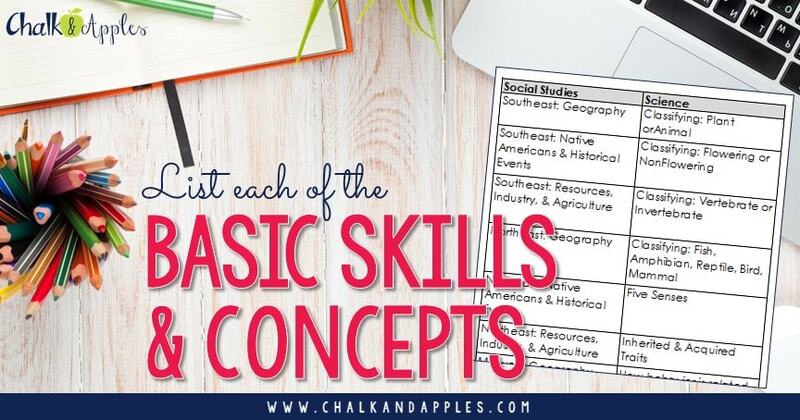 For my map, I started by printing out my standards and making a list of the basic skills and concepts included. I did this in a simple Google Sheet with a column for each subject. Next, I opened my curriculum map and added all of the books and activities I knew offhand I wanted to use that went along with the basic skills. Once I finished adding those that came to mind, I looked through our basal reader and some of my favorite supplemental reading resources. I added books and stories alongside the science and social studies skills they could be integrated with. Take a look at your curriculum list. Is there anything on it that’s seasonal? If there is, go ahead and add it to your curriculum plan for the right week or month. Cross off skills & topics as you add them to your plan. Think about science and social studies skills, favorite books to accompany a topic, etc. In fourth grade, I need to teach about tornadoes and thunderstorms. Around here, it makes a lot more sense to teach those concepts in April than it does in December. Likewise, if you teach anything about the election process or the US government, it would be smart to teach it at the beginning of November. Planning ahead will help you put these topics where they belong, instead of just teaching them whenever you get to it. Go ahead and fill in any district mandates you have to follow. For example, my district is adopting a new math series this year. We’ve been told that they will provide us a scope & sequence in our training before school starts, and that we must follow it. (That’s why my math is blank in the images!) Luckily, I will still be allowed to pull in other resources outside of the textbook, so once I get the scope & sequence, I’ll fill in the skills, and then plan activities from there. Look back at your list again. Start with beginning of the year foundational skills, and work towards the end of the year. Fill in the gaps with skills in the order that makes the most sense or builds on prerequisite skills and concepts. You’ll probably have to do some rearranging here and there to make everything fit, and that’s ok! 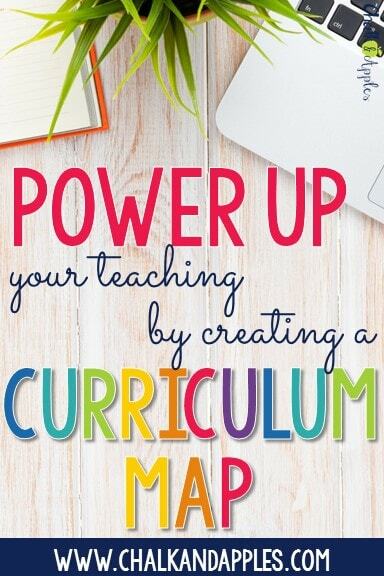 Now that you have a curriculum map… Use it, and Revise it! 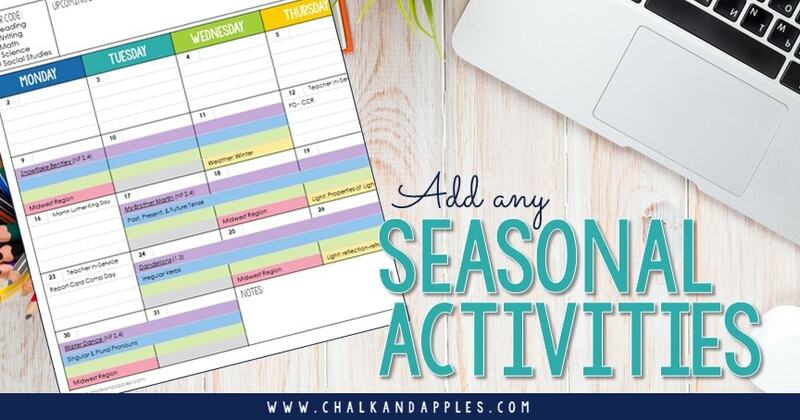 Throughout the year, pop back in to your planning calendar, and adjust it to account for concepts or activities that took longer than expected. Sometimes, as we teach, we realize that the concepts would have been easier for students to understand if we’d taught them in a different order. Go ahead and swap those around in your planning calendar so you get it right next year! 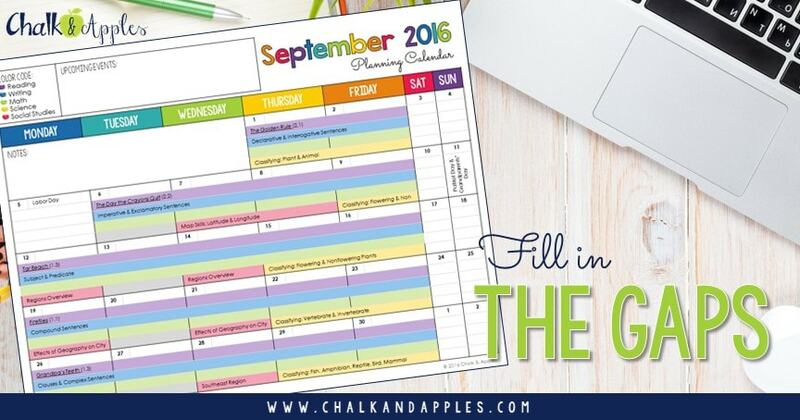 If you’d like the editable planning calendar I used this year, you can grab it in my TPT store. 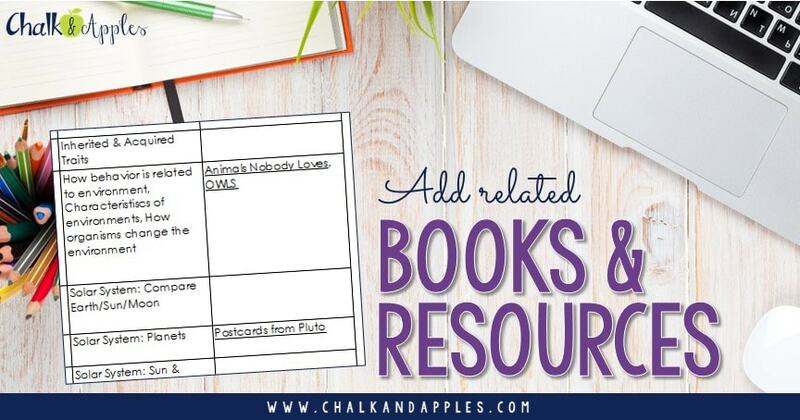 It’s completely editable in PowerPoint, so you can add school events and make it your own! What are you doing now to ensure success in your classroom for the upcoming year? I agree that curriculum mapping is incredibly important! I have been doing it since my first year and I'm so glad I have. I'm definitely going to 'wish list' your curriculum map for later! Thanks! This is an excellent post! Our division encourages us to unpack the standards and work with our PLCs to get at the heart of the content. Great planning and dividing the load helps so much.